This Water Cooler unit includes a Barrier-Free, Rounded Box Drinking Fountain with a round vandal resistant pushbutton. An in-wall chiller assembly is supplied to provide 8 gallons (30.3 liters) per hour refrigeration. Though a 21 inch (53.3 cm) wide trim panel with louvered grille is provided, Mounting Frame (A0000000-MF3) must be ordered (available at no additional cost). The patented Push Button Auto Stop feature is part of Murdock A15-VR units. 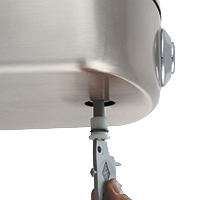 It seamlessly incorporates the heavy-duty Vandal Resistant button for additional security while allowing easy access to the push button for routine maintenance.